A fantastic start to the game for the Bulldogs as they were out to atone for Wednesday and it certainly looked like it as they controlled the first minute of the play in the Clippers end and it was evident that they were ready to play. The period went back and forth with the Clippers responding and pushing back as it was fun hockey to watch with each team getting their share of their chances but both Billy Christopoulos and Guillaume Decelles keeping it scoreless through the first ten minutes. Shortly afterwards the Clippers would open the scoring on the rush as the Bulldogs turned it over at centre ice and the Clippers countered on the transition as Jacob Hanlon put a low shot on net that was kicked out by the pad of Christopoulos and onto the tape Kale Bennett who joined the rush and potted the rebound into the open side for a 1-0 Nanaimo lead at the 10:46 mark of the first. The Clippers went to the power play shortly afterwards looking to build the lead, but the Dogs killed it off and quickly got back on the offense, having several in-tight looks that were turned aside by Decelles. They would hem the Clippers in their end for a spell and draw a power play that they connected on to tie the game at 1-1 as Everett Putz found a loose puck off a dangerous Kurt Gosselin drop pass that he put through a defenders legs and walked around another one before skating in alone on Decelles where he beat him with a quick release five-hole. Scotty Clark also drew an assist on the play at 17:57 of the first for a 1-1 tie after 20 minutes and the Clippers leading the shots 12-10. The Clippers came out hard to start the second much like how the Dogs started the first. The Dogs would be penalized by the back Referee while in their defensive zone early in the period, and the Clippers struck on the advantage to lead 2-1 as Jake Jackson found Yanni Kaldis who walked into the left circle and threw a pass into the crease where it was deflected into the open side by Anthony Rinaldi at 4:08 of the second. The Bulldogs would battle back and tie the game just four minutes later when Scotty Clark found the puck in the right corner off a Drake Brown shot that went wide of the net. Clark would walk up the right wing and realize he was unchallenged before he walked right into the slot and ripped one past the glove of Decelles with Mitch Makin screening in front to make it 2-2 at 8:41 of the second. The Clippers thought they had the go-ahead goal later in the period as a Clipper player skated through the crease and contacted the pad of Christopoulos and spun him entirely out of his crease and behind the goal line. The puck would go out front where it was one-timed into the yawning cage. Neither of the two Referees (one vote for the three Ref system!) would apparently see it, as no call was made. Apparently either of the Linesman thankfully saw the play, as after a long conference between the four Officials the goal was waved off due to incidental contact with the goalie as it stayed 2-2 after 40 minutes, with the Dogs out-shooting the Clippers 12-7 over the period for a 22-19 Bulldogs advantage. The third period couldn't have started worse for the Bulldogs, or better for the Clippers, as they controlled the puck and raced in and went up 3-2 just 16 seconds into the period as a rebound off the pads of Christopolous from a Jake Jackson shot was found by Anthony Rinaldi and put out front for Cole Maier who one-timed it right under the cross-bar from the top of the crease for a 3-2 lead. That would do it for the scoring, as the Bulldogs would push hard for the equalizer but couldn't find it. They had a mad scramble with the goalie out with less than a minute to play but couldn't bet a bounce. As the puck went into the corner the net appeared to be intentionally kicked the net off but the Referee right at the net didn't make a call on it. The final 20 seconds saw the Dogs battle and retrieve the draw but be unable to get control to get a puck on net. 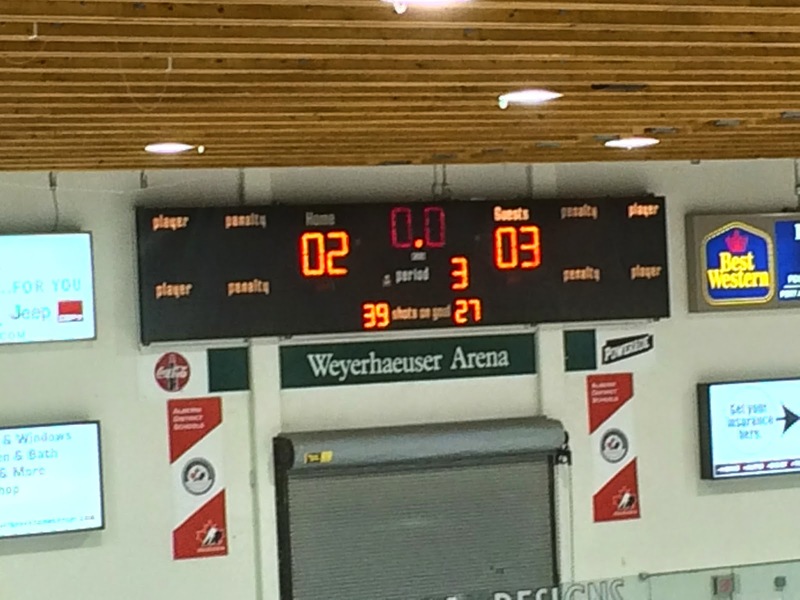 Final shots favoured the Bulldogs 39-27 with each team going 1 for 3 on the power play. Billy Christopoulos took the loss in net while Guillaume Decelles picked up the win. A much much better effort for the Bulldogs in this head-to-head match up, but a frustrating result again. The two teams go at it again on Wednesday at the Dog Pound.